Did you say 20 minutes?!?! Yes, yes I did and at that point it did not seem possible. You see speed is relative. I can run a 5k at a sub eight minute mile. I can run a 10k at a little over eight minute mile. I can run a half marathon in under two hours or a sub nine minute pace…. But when you crank that up to 31+ miles for a 50k with hills, mud, heat and cramping moving forward is tough at any speed. With a mile go I thought I couldn’t run anymore. I was bummed. Broken. Months of training and I thought I may fall short of my goal by minutes. This was my second 50k and the elevation profile looked difficult, but not impossible. The website for The North Face Endurance Challenge said there was a little over three thousand feet of elevation change. I was prepared for the hills and the dirt. What I wasn’t ready for was the mud and the heat. The field of runners converged on the mud within the first mile. It was deep in parts and difficult to navigate. People were slipping in front of me and when the trail turned to single track it was tough to pass people, so we ran one behind another for what seemed to be miles. I felt like I was running my second Tough Mudder instead of my second ultra. My shoes were caked with mud within the first fifteen minutes of the run and they would stayed that way for the next few hours. Miles clicked by and by the turn around point, mile 15, I was holding steady completing the first half of the race in three hours. Not fast by any means, but on pace to cut an hour off my previous 50k time. The tempurature was in the 60s at this point and I was running along side a young guy from Chicago. He mentioned how there were no hills where he is from and that I was lucky to live in Maryland where I could train on hills. He must have never crossed The Chesapeake Bay. Delmarva is flat as a pancake and the only way I train for hills is to visit the local parking garage and run around the outside and up and down the stairs. The only trails where I love are parks with 2-6 miles worth of sandy trails. We ran along the Potomac River and were blessed to see some amazing views of the river and the hills on some pretty rocky technical terrain. There were aid stations every five to six miles and it was there I filled up my fuel belt and chowed down on some PB&J sandwiches and M&Ms… And gulped down some Coke and Mountain Dew… Yes they have all of that at the water stops on these ultra races. I started the race with my good friend Chris and his cousin Eric. Chris was basically running on a broken foot and was taking on the same terrain and difficulties I was, but with foot that had been healing for the last three weeks. We ran the first few miles together and then we were separated by the field of runners and the mud. I kept hoping to see them on a turnaround point, but didn’t. I kept thinking of them. I knew no matter how much his leg was hurting that the mental toughness Chris has would carry him to the finish line. At Mile 25 the true struggles began. The legs became tired of the climbing, the running, the pounding, and the heat. There was no transition period this year. I had not run in the heat since the fall. The tempurature slowly climbed until it settled in the low 80s and towards the end of the race I was sweating and becoming a little sunburned. It was sucking the life out of me. I ended up running for five minutes and walking for a minute… Yes, the Jeff Galloway way. The legs began to cramp up and at one point I tripped on a root causing my legs to give out from sudden cramping. I had to lean against a tree and stretch the cramp out. Runners passed me asking if I was okay and if they could help me… “I am fine, just cramping… Just need to stretch it out”. Passing the marathon point, 26.2 miles, gave me an extra boost of energy and I started running again… Until that last aid station. Again with 1.7 miles to go I hit another wall… I pressed forward and I ran and walked until that last mile. “You okay buddy?” – This guys asks me. “Both of my calves and my thighs are cramping up. I can barely walk” – I said as I relentlessly moved forward. “This is my friend and she is struggling to finish as well… I just met her this past mile” – he stated. I then looked down at their bibs and realize that they were running the marathon relay or six miles each as part of a team. I looked over and saw this lady walking beside me pushing to finish. It then struck me. Clear as daylight. This lady and I needed each other and we needed the guy that had joined her. “We are all going to finish…. Together. If he can run on cramped legs after thirty miles we can run beside him” – He said to the lady… and I believed him…. And so did she. I somehow… Someway… Started to run again…. And so did she. All of a sudden I had a fan club, but most importantly I had two instant friends that finished strong with me. Dean Karnazes once said he would take motivation wherever he could find it. I lived that quote today. Sometimes it just takes looking around and accepting help, receiving inspiration, or reaching out to help another person to move forward… And sometimes it takes just pushing everything aside and plowing through, knowing that things may be difficult and dark… But they say the sky is always darkest before the sun rises. And the sun did rise. A little while later I received a text. Chris and his cousin Eric had just crossed mile 30. 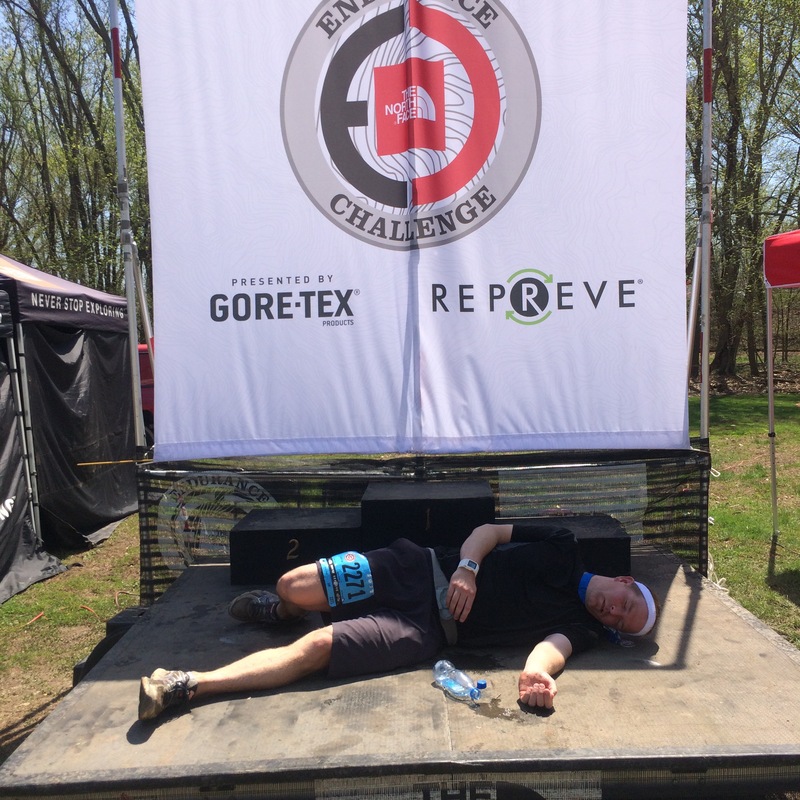 I went back to the finish line and watched my friend of over 25 years complete his first ultramarathon. While strangers were pushing me along his cousin and good friend, Eric, was pushing Chris forward. The joy I felt watching a good friend reach such an amazing goal equaled or surpassed the joy I felt just moments earlier. I believe any journey worth taking is worth taking with others. The ultra journey this past week taught me that at times we carry others and at times others carry us… But we always finish with the strength of others. First Happy birthday. Second that was an incredible story that made me tear up. You are such a great inspiration for your kids! Outstanding job-you are a rockstar! Thanks for sharing! Love this! Great review! This was my 3rd 50K and a PR. However, the last 8 miles seemed to never end and I started wondering if I was going to make the cut off time. Glad you ran into a November Project folks. They are incredibly positive and supportive! Congrats on your PR!!! It was a great race! Trent – It was great to meet you. You were incredible the way you pushed through the pain; you were our inspiration to keep going. Congrats again on your PR! And if you’re ever in DC, come out and join our November Project group.